Bel-Air Country Club conjures up images of movie stars, and so many played golf here – Bing Crosby, Clark Gable, and many other well known personalities have graced the grill room and pro shop. It was a heady experience for a Mississippi boy taking his first job as head golf professional. It has been a great opportunity for me and everyone at Bel-Air has supported me from the beginning. They encouraged me to pursue my playing career and provided so many opportunities for me to do so. We have two great institutions in our neighborhood, Bel-Air Country Club and UCLA. 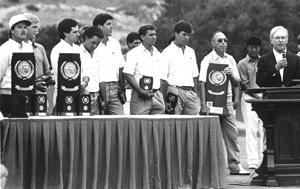 In 1975, when I was invited to coach the golf team at UCLA, the membership at Bel-Air made it possible for me to fulfill two of my greatest passions, teaching and coaching golf. During my 15 years as coach at UCLA, I was privileged to coach 16 All Americans, win a National Championship, and most importantly develop life long friendships with so many wonderful student athletes. Now, on to the next tee box. Two great players against whom I competed many times come to mind when contemplating this as they were polar opposites in their physical stature and swing planes. The great American amateur William C. “Bill” Campbell and the great Canadian professional Moe Norman. Bill Campbell was well over 6 feet in height with a statuesque build that suited his tall, straight frame and a rather upright golf swing. His stance was quite narrow with his right foot positioned very close to his left. This narrow stance accommodated his classic, high, vertical swing quite nicely. Moe Norman, considered by many to be the greatest ball striker ever to play golf, was of average height, about 5 foot 7 inches tall, with a muscular broader development, with slightly bowed legs. His natural structure demanded that he assume a wider stance with his right, or rear leg. This foundation made for a shorter, wider, flatter swing plane. Quite a contrast in these two different styles, yet both proved to be imminently successful. Each player assumed the stance and swing that made them most comfortable and effective with their shotmaking. Two divergent styles of stance and swing that best suited each player’s physicality. Each player must assume the stance that makes them the most comfortable and athletic so that the swing can be repeated as effortlessly as possible, while keeping the ball placement precisely and consistently positioned opposite the forward heel. The stance will narrow slightly and progressively as the shots required become shorter in distance. This is accomplished by moving the rear foot closer to the lead foot, keeping the ball placement constant. As the player settles in to this comfortable stance, weight distribution becomes an important consideration. Weight transfer and shift while maintaining good balance is directly influenced by how the player distributes his or her weight at address. The player should set up with about the same amount of weight on each foot, except with a 60 – 40 percent ratio, with 60% placed on the rear foot when the shot calls for more distance. This will help ensure shifting of weight onto the rear foot during the backswing and, in turn, will assist proper forward thrusting of the legs during the downswing, delivering a descending stroke. For shorter pitch shots, chip shots and bunker play around the green, the weight distribution at address should be reversed, favoring the forward foot with about the same 60 – 40 percent ratio. The knees should be slightly flexed so that the weight settles equally between the ball and heel of each foot. At no time during the swing should the weight be allowed to move onto the toes. This would cause the player to sway forward toward the ball leading to wayward shots. Centrifugal force during the swing pulls the player toward the ball and onto the toes, keeping the weight properly distributed between the balls and heels will resist this outward tug. One other tip that will help resist lateral sway is to point the rear knee slightly inward at address so that the player swings against the inside of the rear leg, bracing against allowing the weight shift to move over the rear foot. This pointing of the knee also is a preview of the proper thrusting of the leg to start the downswing so it serves a dual purpose. All of the “Set Up” essentials we have covered thus far; Posture, Balance, Ball Placement, Stance Width, and Weight Distribution will ensure that the player is in position to make a smooth, athletic, consistent, swing. The remaining essential, Alignment, will help direct the ball on the proper trajectory and direction. Contrary to popular belief, I do not subscribe to the concept that alignment of the feet have a significant impact on shot direction. Ball flight and direction are a function of the club handle, which is controlled by the direction and path of the forearms and the positioning of the club face. Since the arms are connected to the shoulders, I do believe that proper alignment of the shoulders at address will improve your shot making accuracy. Most golfers tend to set up with their shoulders slightly open, or pointing to the left for right handed players and to the right for left handed players. The shoulder line at address should be parallel to your target line. Ball placement off the forward foot causes this natural rotation of the shoulders. In order to “square” the shoulders, imagine a line extending from the target through the ball and align the shoulders to this imaginary line. A very slight rotation of the shoulders during address will set them properly. Aligning the shoulders this way will enable you to move the handle of the club down this parallel path. There are many great players such as Gary Player that played from a closed stance (when the lead foot is positioned forward of the target line), and an equal number of other champions such as Fred Couples, that play from an open position (when the lead foot is positioned backward of the target line). They all have one thing in common; at address, their shoulders are parallel to their target line. See you on the next tee when we’ll discuss wiggling and waggling the golf club, looking at the target, and the forward press. In the meantime, I wish you continued success.